California has a long history of success in leveraging innovations in science, technology, management and implementation strategies to improve its resource management, including its continued leadership in energy efficiency. The State’s best strategy for dealing with its water challenges, both current and future, lies in taking a system management approach to water similar to the approach used for energy. Also, as with energy, innovative water technologies represent a sound business opportunity for California. 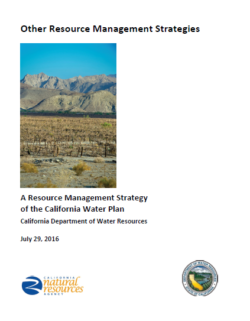 This report highlights innovations in science, technology, management, and implementation across a broad range of water supply, demand and management areas, and suggests strategies and recommendations for continued investment and support of innovation in California. 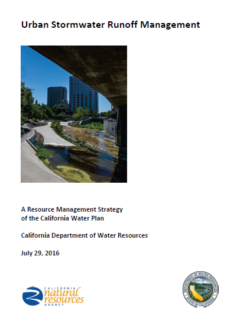 It is our assessment, as detailed in this report, that continued innovation both through the development of new solutions and the broader application of proven successes can help California improve its water management and support a long-term healthy and sustainable water system. In order to be successful, however, we will need to align our efforts on an integrated set of strategies (roadmap) that will require leadership, action and investment by both the public and private sectors. 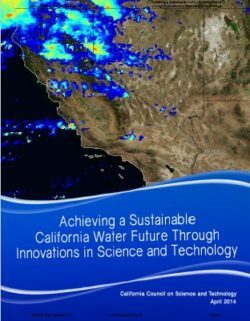 This report draws on a wide spectrum of water technology experts throughout the state, from academia, state and local agencies, non-governmental organizations, and the private sector, to identify and describe innovative water technologies and/or systems approaches with significant potential to help California achieve water sustainability. Our intent is to include technologies that can be introduced or more widely applied to California’s water system(s) within the next five to ten years, and which are suitable for implementation at levels ranging from local to statewide. It is our belief that many of these recommendations lend themselves easily to the development of policy actions needed to support implementation. It is beyond the scope of this study to evaluate the economic viability or potential of individual technologies and other innovations. Drywells are gravity-fed, excavated pits with perforated casings used to facilitate stormwater infiltration and groundwater recharge in areas where drainage and diversion of storm flows is problematic. Historically, drywells have predominantly been used as a form of stormwater management in locations that receive high volumes of precipitation; however the use of drywells is increasingly being evaluated as a method to supplement groundwater recharge, especially in areas facing severe drought. Studies have shown that drywells can be an effective means to increase recharge to aquifers; however, the potential for groundwater contamination caused by polluted stormwater runoff bypassing transport through surface soil and near surface sediment has prevented more widespread use of drywells as a recharge mechanism. Numerous studies have shown that groundwater and drinking water contamination from drywells can be avoided if drywells are used in appropriate locations and properly maintained. The effectiveness of drywells for aquifer recharge depends on the hydrogeologic setting and land use surrounding a site, as well as influent stormwater quantity and quality. 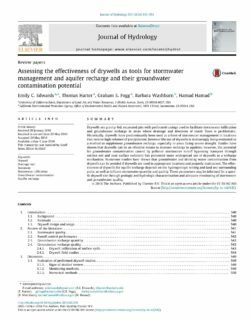 These parameters may be informed for a specific drywell site through geologic and hydrologic characterization and adequate monitoring of stormwater and groundwater quality. Desalination, the removal of salts from saline waters, is one of the few options available to augment California’s water supply. California has facilities that desalinate sea water for coastal communities and brackish groundwater for inland water users — many of which have provided high-quality water to their customers for more than 10 years. As water supplies in California become more constrained, many water suppliers with nearby saline water sources are evaluating desalination as a way to provide reliable supply in response to uncertainties relating to future drought and climate change. While desalination is not a viable method for many water suppliers in the state, some not yet engaged in the process could realize significant supply and reliability benefits — even though desalination of both sea water and brackish groundwater comes with financial and environmental challenges. For water suppliers with desalination opportunities, how they implement environmentally sustainable projects is a key issue facing multiple California communities. 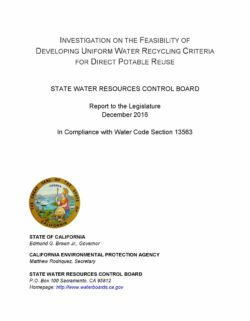 In 2010, the California Legislature enacted Senate Bill (SB) 918 (Chapter 700, Statutes of 2010), which added sections 13560-13569 (Division 7, Chapter 7.3) to the Water Code regarding potable reuse of recycled water. SB 918 defined the term “direct potable reuse”1 and directed the California Department of Public Health (CDPH) to investigate the feasibility of developing uniform water recycling criteria for direct potable reuse (DPR), convene an expert panel to study the technical and scientific issues, and provide a final report to the Legislature by December 31, 2016. The main difference between DPR and indirect potable reuse (IPR) is DPR’s lack of a meaningful environmental buffer. In 2013, the Legislature enacted SB 322 (Chapter 637, Statutes of 2013), which amended Chapter 7.3 of the Water Code to require that an advisory group subject to the Bagley-Keene Open Meeting Act be convened to advise the expert panel and the State Water Board in the development of the feasibility report. SB 322 additionally tasked the expert panel to assess whether additional areas of research are needed to be able to establish uniform regulatory criteria for DPR and to recommend an approach for accomplishing any additional needed research in a timely manner. SB322 required that a draft report summarizing the expert panel research recommendations be prepared by June 30, 2016, and a draft feasibility report be provided to the public for comment by September 1, 2016. California is increasing its integration of municipal recycled water into its water supply portfolio. In some regions of the state, recycled water meets approximately 7 percent of water supply demands. Although the statewide total is an increase since California Water Plan Update 2009 (Update 2009) was released, it is still far short of previously established goals. Municipal recycled water benefits the state and individual water users by reducing long-distance water conveyance needs, providing local water supplies, and being a drought-resistant resource. 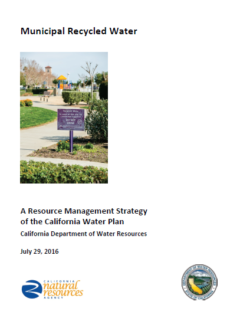 This resource management strategy report will describe the current status of recycled water in California, what some of the challenges are to its increasing use, and the resources needed to continue to increase municipal recycled water use. 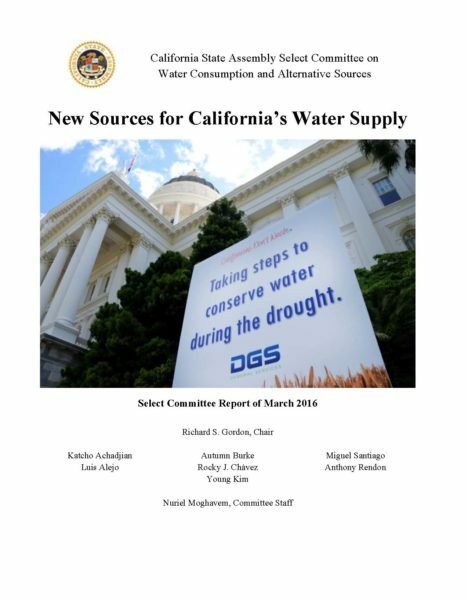 The Assembly Select Committee on Water Consumption and Alternative Sources was established in February 2015 to examine the strategies California could take to improve water conservation and expand the portfolio of water sources. Given that California rose to the challenge of conservation, the committee turned its attention to alternative water source strategies such as stormwater capture, ocean desalination and water recycling, holding specific hearings to discuss the latter two in greater detail. findings and recommendations compiled by committee staff and approved by the Chair. These findings and recommendations were not voted on by members of the Select Committee and may not reflect the view of each Select Committee member. 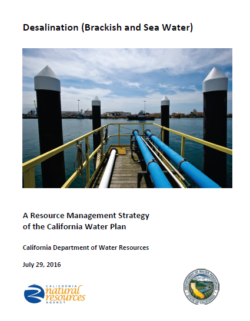 This report is meant to provide knowledge regarding California’s drought, climate change future, and viability of water sourcing strategies including stormwater capture, water recycling and desalination. This knowledge will be essential in adapting California’s water infrastructure to climate changes and devising the most effective and environmentally friendly approach to endure the next California drought. This narrative highlights a variety of water management strategies that can potentially generate benefits that meet one or more water management objectives, such as water supply augmentation or water quality enhancements. However, these management strategies have limited capacity to strategically address long-term regional water planning needs. These are unique strategies and do not fit into the other classified strategies. In some cases, such as dewvaporation, the strategy involves emerging technologies that will require more research and development. Other cases, such as crop idling and irrigated land retirement, involve voluntary and often temporary tradeoffs from one sector of use to another (i.e., agricultural to urban) that will likely be unpredictable and limited in scope. Finally, implementation of strategies, such as rainfed agriculture, will have limited applicability in California because of the variability and uncertainty of precipitation patterns from year to year. • Crop idling for water transfers. • Dewvaporation or atmospheric pressure desalination. Communities throughout California are facing serious and growing threats to their ability to provide a safe, reliable supply of water. Drought, coupled with over-allocation of existing water sources, is affecting cities, farms, businesses, industries, and the environment all across the state. For many communities, 2013 was the driest year in a century, and the lack of precipitation has critical implications for the continued viability of surface water and groundwater resources that supply our cities. The long-term effects of climate change are likely to exacerbate this. 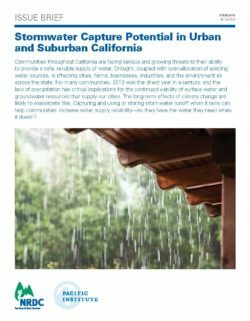 Capturing and using or storing stormwater runoff when it rains can help communities increase water supply reliability—so they have the water they need when it doesn’t. 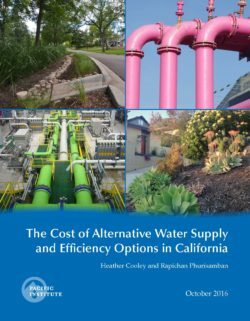 The Cost of Alternative Water Supply and Efficiency Options in California is the first comprehensive analysis to examine the cost of various strategies throughout the state to augment local water supplies and reduce water demand in urban areas. The study uses methods developed in the field of energy economics to determine the “levelized” costs of each supply and demand management option. The study finds that the cost of new supplies in California is highly varied. Large stormwater capture projects are among the least expensive of the water supplies examined, with a median cost of about $590 per acre-foot. By contrast, seawater desalination, with a median cost of $2,100 per acre-foot for large projects and $2,800 per acre-foot for smaller projects, is among the most expensive water supply option. Brackish water desalination is much less expensive due to lower energy and treatment costs. Generally, the cost of recycled water is in between that of stormwater capture and seawater desalination. Non-potable reuse – which treats water for irrigation and other non-drinking purposes – is typically less expensive than indirect potable reuse due to the lower treatment requirements; however, the cost of building or expanding a separate “purple pipe” distribution system to deliver non-potable water may be such that indirect potable reuse could be more cost effective. Nonetheless, the study finds that urban water conservation and efficiency are the most cost-effective ways to meet current and future water needs. Indeed, many residential and non-residential measures have a “negative cost,” which means that they save the customer more money over their lifetime than they cost to implement.